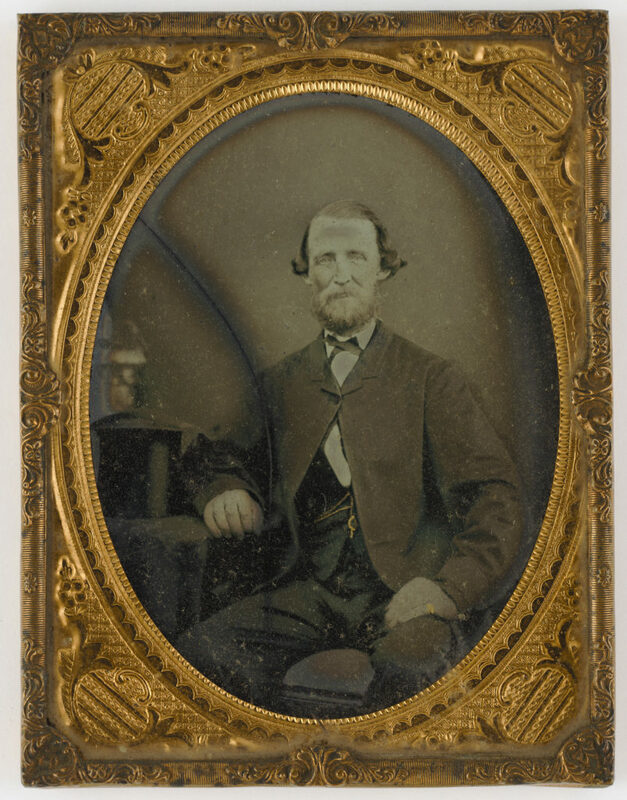 This front facing ¾ seated ‘ambrotype’ shows a male subject who looks to be aged in his 50s, which may place some doubt on its attribution as Sergeant William Ormrod. As the identity of the photographer is also unknown, this portrait is best dated by its photographic format and the sitter’s clothing. The subject is posed in the act of paying a social call, as indicated by the top hat placed crown side down on the table beside him, though this clothing accessory may also be a studio prop. At the time this image was made, Sergeant William Ormrod would have been aged about 35, and it is possible his wartime service in Crimea may have taken a toll on his appearance. Whatever his true identity, however, the man in this portrait wears an ensemble of mismatched suitings typical of the 1850s, including the typically generously-cut ‘sac’ coat which only emphasises this sitter’s thinness. This wider, looser style of coat was popular from the second half of the decade into the 1860s. The subject of this portrait wears his longline version fastened high at the neck with a single button below a narrow collar, over dark wool trousers, a [matching] single-breasted waistcoat with a gold watch chain and fobs, and a white shirt with a turn down collar and ribbon necktie. He wears the full beard of a returned soldier, his longish greying hair brushed back from his forehead with a side parting, and curling over his ears. Sergeant William Ormrod (c.1823-1878) is thought to have served in the Crimean War (1853-1856) and to have come to Australia from India, to buy horses. Staying on with Governor Fitzroy, he later started the first brickworks in Ryde. In 1858, he married Amelia Dorcas Troughton (1835-1914), who is believed to be a daughter of Dorcas (c.1808-1880) and James (c.1809-1873) Troughton of Parramatta. At the time of his death, aged 55, in 1878, Ormrod’s profession was given as foreman at Stewart’s cedar yard, Pitt Street. Buried in the graveyard of St Anne’s Church, Ryde, he left an estate that included a substantial amount of property in Glebe.